Someone behind-the-scenes at Microsoft may have accidentally confirmed the existence of the HTC Titan III. 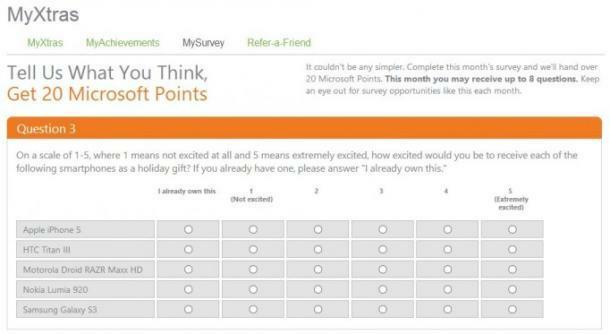 Or it could be a typo, since the device, listed in a Xbox Live Rewards survey that mentions already available handsets, doesn’t even exist. It’s been awhile since we’ve mentioned or even heard much info about the follow up to this year’s Titan II. There have been some rumors suggesting the trilogy device, likely codenamed Zenith, will arrive with Windows Phone 8 and quad-core processor, but it’s been a few months since anything official or unofficial has been mentioned. The proposition of better specs and Microsoft’s latest OS isn’t hard to estimate at this point, and the inclusion of NFC makes sense seeing as the Redmond company is putting stock in a Windows wallet option. Zenith was previously mentioned alongside the HTC Rio (publicly known as the 8S) and the HTC Accord (the Windows Phone 8X), which have both been launched. The Zenith, or Titan III, was rumored to launch in Q4 of 2012, but with less than thirty days left in the year, it seems unlikely we’ll see it released in the next few weeks. CES is just around the corner, which might used as a platform to unveil such an anticipated device. We’ll probably hear more pertinent information soon.